2 Sessions of Clays - 25 clays of tuition and then a competitive 25 clays session against your mates! Amazingly exciting. Central location. There can be few experiences like blowing whizzing clays out of the sky with a high powered shotgun! Whether the clay pigeon is coming at you from the left, from the right, or even straight over your head, as long as your reactions and wits are about you, you'll be having a blast! The shooting school consists of competition-standard range and equipment, where our expert tutors will take novices through every aspect of clay pigeon shooting, and experienced guns can perfect their craft with the very best advice. 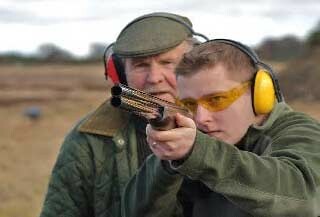 Your programme will start with an introduction to clay target shooting followed by a health and safety presentation to make sure you know how to hold and carry the gun..
the first will involve personal instruction over different stands. At the completion of the first session, tea, coffee and biscuits will be available. The second session will involve an inter-group competition. Score cards will be completed to identify the "high gun" of the day and the winner will receive a Central Scotland Shooting School trophy.